The Figure 9 illustrates the interactions between the various components of the framework. 1. Adapter Configurator is used to build the adapter configuration. The Adapter Configurator tool configures the adapter to perform a particular operation such as querying a specific database table, or communicating with a particular information system. The configuration also includes setting any adapter-specific configuration parameters such as temporary directories, or usernames and passwords. 2. The Adapter Configurator is an adapter-specific GUI component that is used to build the adapter configuration. Usually the Adapter Configurator GUI is started from Progress Developer Studio for OpenEdge, but it can also be started as a standalone program. The Adapter Configurator reads the adapter definition file and displays the appropriate UI. 3. Adapter Configurator stores the configuration in the file config.xml. Refer to config.xml for description of the file. 4. Both the files, mapping.prop and config.xml are stored in the preconfigured adapter instance directory and are not yet associated to a specific BP Server Application or a Web application (formerly a BPM WebFlow process). 5. Map Configurator. When a Managed Adapter workstep is created, you need to define the mapping between dataslots and adapter inputs/outputs. 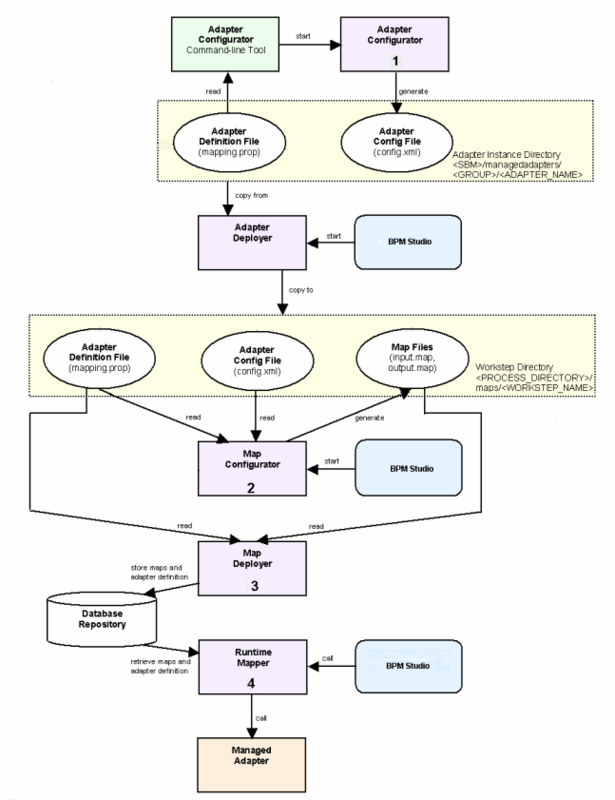 The Map Configurator is a GUI component that allows you to define the input and output maps. It is a pluggable component, indicating that you may develop your own map configurator to handle complex or adapter-specific mapping. The Map Configurator GUI is started by Progress Developer Studio for OpenEdge. 6. Map Deployer. When a Business Process Server process is ready to be published, the maps and adapter definition also need to be published (or deployed). The deployment of maps and adapter definitions indicates that the data stored so far in various files is processed and transferred to a database repository, where it will be available at the process execution time. This operation is performed by the Map Deployer, which is started either automatically by Progress Developer Studio for OpenEdge or Business Process Portal, or by using the MapDeployer command-line tool. Note: If you re-install OpenEdge Business Process Server, or use the setupOEBPS utility, the deployed maps are no longer available in the repository, and you must use MapDeployer to redeploy the mapping. 7. Run-time Mapper. Once the maps are deployed in the database repository, the Managed Adapter can be used. When a Managed Adapter workstep is executed, BP Server or BPM WebFlow communicates to the Managed Adapter through the Run-time Mapper. The Run-time Mapper is a component that interprets the input and output maps stored in the database repository, converts the dataslots to a form acceptable to the adapter, and after the adapter execution is completed, transforms the adapter output back into a set of dataslots. 8. The Run-time Mapper is a pluggable component, indicating that you may develop your own mapper to handle complex or adapter-specific data transformations, in case the default mapper is not adequate.